Get rid of Wasp Nests and Enjoy Your Home! Click to Get a Wasp & Wasp Nests Removal Quote Now! Yellow Jackets have a shiny black and yellow body that measures 2-3/4 inches (12-18mm) in length. The stinger of the yellow jacket is located at the rear of the body and is hollow, until penetrated through skin, then in which venom is used through the stinger to administer into the skin. These insects live in large caste-divided colonies and are commonly mistaken for bees as the appearance of both are extremely similar. 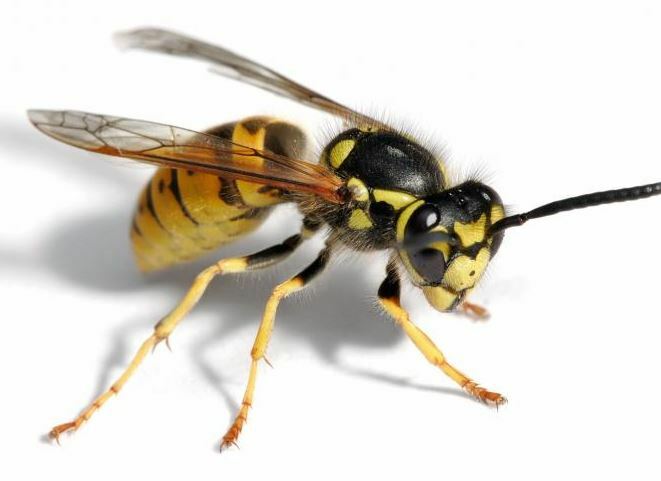 Yellow Jackets are able to sting rapidly, whereas, bees may only sting once before they die. Yellow jackets usually only sting when being provoked or protecting their nest but can also sting randomly when unprovoked. Before the winter season the queen wasp will mate, and locate a suitable place to “over winter”. The queen wasp is the only one of the entire colony to survive over the winter season, while the rest of the colony dies off. Once the queens come out of dormancy, she will begin to feed and search for a resting site for the upcoming season. The nests consist of a paper like material, gathered from decaying wood and fibres mixed with saliva. All nests consist of 20-45 cells in which the queen lays her eggs in. The queen then protects these cells until the larvae emerge. The larvae are then fed until pupate. Adults emerge from the pulpal cases approximately 3 weeks after. Sterile wasps then take over the duties of the queen. Once the colony has fully developed, the sole responsibility of the queen is to keep reproducing. 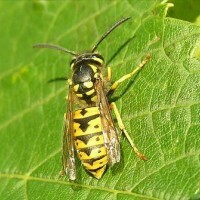 The most effective way is to avoid any contact with the wasps or any other type insect that has the ability to sting. Due to the fact that the wasps are attracted to sweet foods and strong scents, it’s important that safety equipment and extreme caution be taken when removing these nests. Removal of a wasps nest is necessary if it is located near human activity, or a residence. Although the homeowner may remove the nest themselves it is advised that a pesticide professional come and remove the nest with the proper supplies and safety equipment needed. Bald faced hornets are the most common tree nesting hornet. They are easy to recognize due to their color pattern. Their entire body is black and white with Smokey wings. 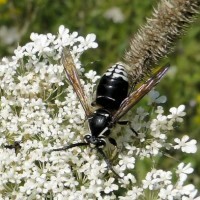 This particular type of hornet is commonly located in forests, meadows, gardens, and parks. Their nest consists of chewed up strips of wood combined with saliva. The walls of a large nest are approximately 2 inches thick, which makes the nest insulated from heat and cold. One nest is capable of holding up to 700 hornets at a time. Much like the yellow jacket hornet the queen lays her eggs within the cells of the nest, in which the female wasps then take over the duties of the queen. Unlike the yellow jackets, the bald faced hornet queen dies off with the rest of her colony once the winter season approaches. It is not advised to remove this type of nest on your own due to the fact that bald face hornets are extremely protective of their nest and if proper caution is not taken, the wasps will sting repeatedly. A pesticide professional is encouraged to remove this type of nest with the right safety equipment. 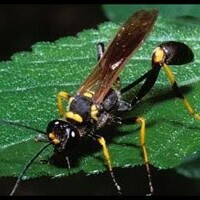 There are over 22 species of paper wasps. 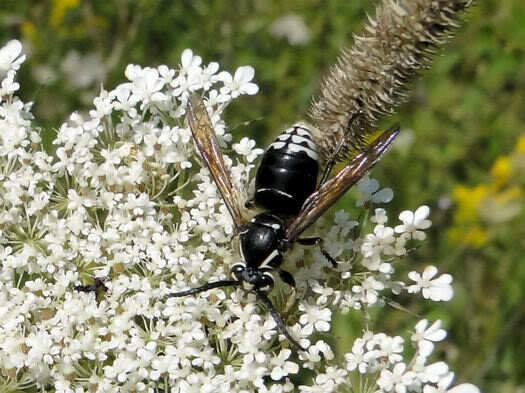 These wasps measure 1.9-3.2 cm in length, and have narrow bodies that are dark brown in color with black wings and yellow markings. Nests are constructed from plants combined with saliva, which, in turn allows the appearance of the nest to resemble paper. Nests do not have an outer, which makes the cells of the nest visible, which is how it came to be called The Umbrella Wasp” due to the fact that the nest resembles an umbrella. 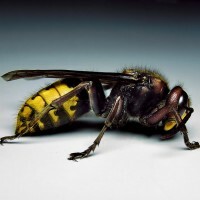 The European hornet belongs to the family identified as the “vespids”. European Hornets are large and extremely aggressive. Extreme caution must be taken when approaching the removal of one of these particular nests. An adult European Hornet is approximately 25mm in length and are yellow-brown in color. Over “wintering” the queen is typically 10 mm larger than the average hornet. Nests are usually located within a hollow tree or wall void. These nest are very rarely seen as they are usually “free suspended”, and the entrance to the nest is usually about 6 feet off the ground, in some cases higher. Males and females mate each fall, in which, these females become next seasons queens. Over the winter season these queens survive only under loose bark, tree cavities, and wall voids. The rest of the colony will die off over the winter season. Much like Yellow Jackets, and Umbrella Wasps (paper wasps), European queen hornets makes new nests and deposit their eggs in the cavities/cells of the nest. After the larvae mature and become sterile female workers, they then collect food and cellulose to expand the nest and protect it from threats. European hornets can feed on crickets, grasshoppers, large flies, and caterpillars. It is extremely imperative to have a professional remove these nest due to the extreme danger these insects can cause. 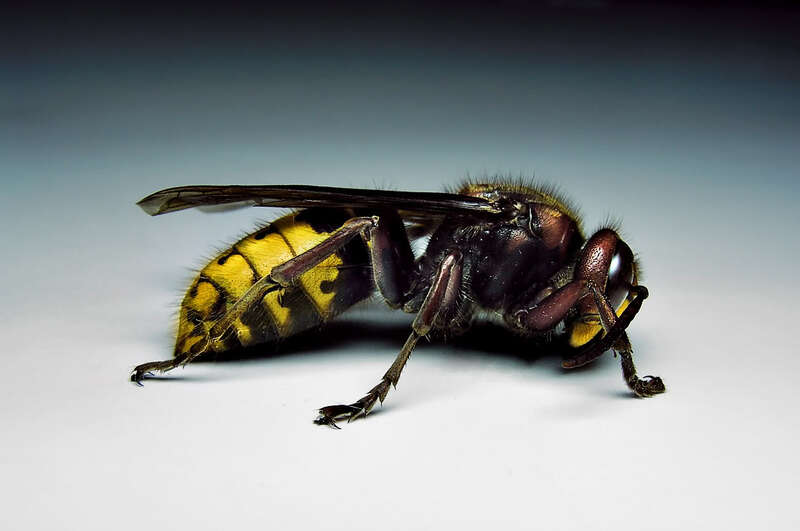 Never attempt to plug the entrance of the nest as European hornets are capable of chewing their way through interior wall covering which can lead to the hornets entering your home. 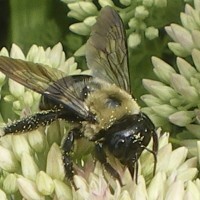 Carpenter bees resemble bumble bees in size and appearance. They are not social insects. 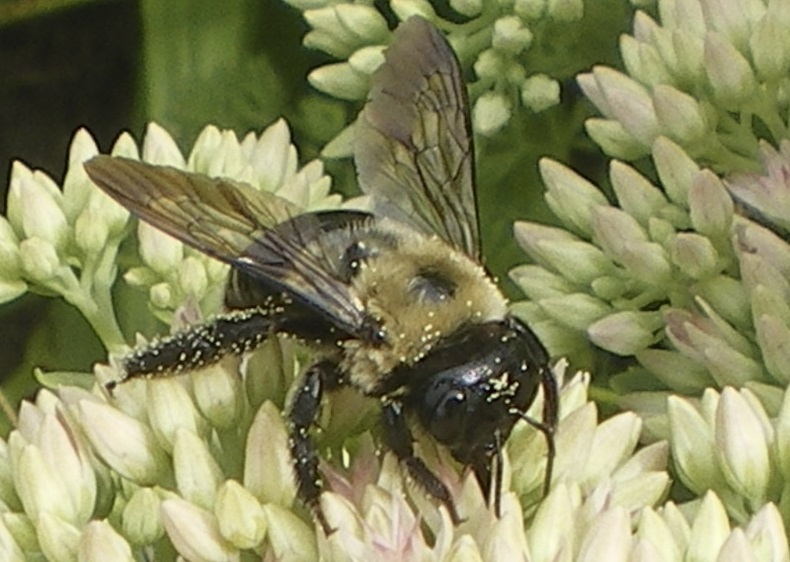 Carpenter bees are commonly mistaken for bumble bees, due the vast resemblance of both. If there are a number of large bees hovering near eaves drops, or drilling in wood, it’s a good indication that you have carpenter bees. This type of bee is unable to sting (males), females however, are able to sting but it is very rare that a female carpenter would sting. Carpenter bees do not eat wood. They usually attach unpainted objects, such as, doors, window shells, roof eves, shingles, railings, telephone poles, and wooden lawn furniture. During the winter season young adult, male and female, bees hibernate in tunnels. They mate during spring season, and enlarge the old tunnels or create new chambers for their young. Each chamber is created specifically for the type of bee brand. A mixture of pollen and nectar serve as food for the larvae. An egg is then deposited on the food supply, and then the cell is then closed off. The female creates around 6-8 chambers. The larvae then hatch from the egg which completes the full development of the bee. Adult carpenter bees start to arrive in august, feed on nectar, and return to their tunnels over the winter season. Once the professional technician has located the nest, an insecticidal dust is applied directly into the nesting opening. If treated during daytime hours a pesticide spray may be used to kill any surrounding bees outside the nest, so the technician is able to locate the opening. Protective equipment must been worn by the professional as the dust can become airborne. The opening of the nest is allowed to be kept open as other bees will enter, and upon entering will track the dust throughout the nest ensuring the nest be terminated. 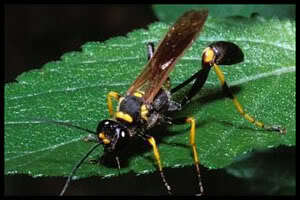 The mud dauber, also known as, dirt dauber, dirt digger, dirt diver, or most commonly, a mud wasp. A nest resembles a cylindrical tube; i.e. : organ pipe or pan flute. They build these nests very elegantly along the edges of cliffs, buildings overhangs, and other sheltered structures. The nest is composed of cylindrical cells, which are then plastered over and smoothed put to make a smooth shape that resembles a baseball. These black and yellow daubers build one celled nests so that they are capable of fitting in such small, unique places.